What would you like to know Kay? I am devout Catholic who prays both the Rosary and the Divine Mercy Chaplet and I use both a standard Rosary and what is also known as a Benedictine Chaplet which can vary in design a bit but generally consists of only a single decade but everything else the same as a normal Rosary. I also pray a Chaplet of St. Michael the Archangel which consists of 10 “quads” (I call them) of one Our Father and three Hail Marys. Nine of them in honor of St. Michael and the nine choirs of angels and the other four in honor of the individual Archangels Michael, Gabriel, and Raphael, and our guardian angel. Please feel free to contact me if I can supply any other info for you. My interest in prayer beads started soon after I moved to a small fog-bound Atlantic Canadian city in the late 1980s. I was befriended by a 75 year old United Church peace activist who believed interfaith prayer was the key to building world peace. He planned a prayer “summit” at a hillside Marian shrine centred on the shared practice of praying beads and featuring Buddhist, Muslim and Catholic bead prayer. So, one grey spring morning I found myself happily sandwiched in the back seat of a Corolla between a Buddhist and a Muslim sharing their ideas on world peace, chugging up a steep hill in sleet and hail (which was almost the size of prayer beads). Happy, that is, until I realized that I was the Catholic who was supposed to pray the rosary. Although I practiced my faith, I was a child of Vatican II and neither owned nor even knew how to use a rosary. My embarrassment was relieved by a Quaker friend who volunteered to offer an ecumenical Christian prayer instead, and eventually by the fact that we were cancelled due to weather. As it happened, the other pray-ers had come prepared to talk about, not actually use their beads. Like most of life, the journey became the learning experience, not the destination activity. But I became interested in beads. Over the last 20 years I received as gifts Muslim, Buddhist, Anglican, and traditional Catholic beads, but they remain decorations in my prayer space rather than spiritual tools. My latest “gift” (of sorts) is a six month medical leave from work, so I can no longer use the “lack of time” excuse for my bead neglect. While I was searching an online book store for yet another book about contemplative prayer today, I came across and pre-ordered Bead One, Pray Too and then found this blog. My challenge is to stop reading (and chatting) about beads and start praying with them. I think the book will help and now off I go to try some of the prayer ideas from the blog. Connie! I am THRILLED to have you as a reader of this blog and of the book! Your comment above just made me cry! Thank you so, so much for finding the book and this blog. I hope you become a regular reader and contributor! Tell us what kind of beads you begin to use and how you use them – if you are comfortable sharing with us. Welcome and thanks so much! And feel free to contact me any time if I can be of any help at all. I have been making prayer beads for about a year now. As a life long catholic I started with the standard 5 decade Dominican rosary with beads made by me out of ground dried rose petals and polymer clay. As I began to explore my interest in things medieval got me into making paternosters. then in honor of my Eastern European roots, Choktis. Now I find myself beginning an ecumenical journey with malas and a more internal and personal prayer and meditation. This evolution has deepened my spiritual life and taken me in directions as a seeker I had not thought possible. I found this blog searching for Jewish prayer “beads” I have a request to make something for a friend of a friend who is Jewish. I have been making decades Rosaries and putting a medal of Jesus on one end. We have the Star of David but wondered if there is a short grouping of beads that might represent a form of prayer like the decade version of the Rosary. Any ideas? and bead colors for significance? thanks for any help! Wondering how you made out with creating a Jewish prayer Beads? I am really interest in making one for my friends’ daughter and I honestly don’t know where to begin. Of course I discovered you letter tonight and hope you can help me out with your knowledge and experience. I was actually looking up instructions for a Lutheran Rosary.. which I would like to make for myself and others within my church…and so on. I think it is just a wonderful, loving idea. Hope to hear from you soon. Hi, Jean. I wrote a book on prayer beads called “Bead One, Pray Too.” If you can find it at your library (or order it from amazon), on pages 6 and 7 I talk about how the Jewish tradition is one of the few with no tradition of prayer beads. BUT it does have a tradition – a very rich one – of numbers and even a kind of counted prayer. It’s too detailed for me to go into here, but if you get the book, or look up the words “tallit” and “tzitzit” you may find some help. The tallit is a Jewish prayer shawl and the tzitzit are knotted fringe on its ends. Each knot is tied in a very specific way, with certain numbers of knots and wraps that mean certain things. That might help you with the numbers of beads you would use for your friend. Use this as a start and let your imagination soar. Any beads you make for him or her will be incredibly special. Jean, I was interested in what you had to say. I could not get the book through our library system, but learned of it when researching jewish life the other day. When I was a child my mother gave me the Catholic Rosary and taught me the prayers, but not being Catholic, I have forgotten alot. In looking for how to make the prayer beads, I just found an idea that might work. 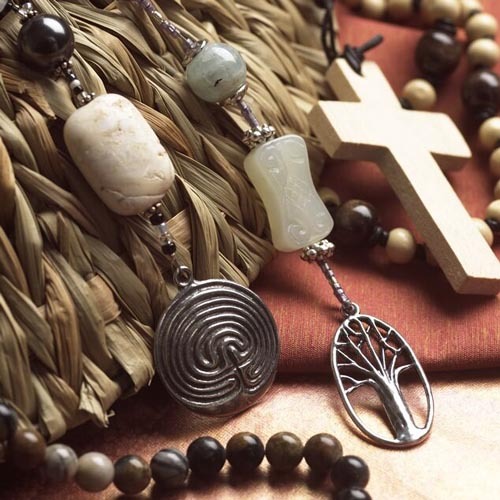 The composition of the Anglican Prayer beads could work as prayer beads in the Jewish faith. I think if one used that construction and instead of the cross use the star of David, it would point to God as Jehovah. For me, the star of David represents light coming into the world and I think it also stands for HOPE. Well, this is an idea and come summer I will be able to once again engage myself in my bead working ideas.